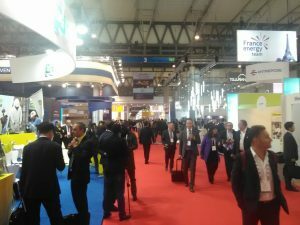 GASVESSEL’s member ESTECO attended the Gastech Exhibition & Conference in Barcelona. The visit offered loads of new interesting insights since the major gas and energy companies of the world were present; over 500 companies were exhibiting at the stands. ESTECO promoted the GASVESSEL project and stressed the importance of CNG in the future. Get in touch with the GASVESSEL project.